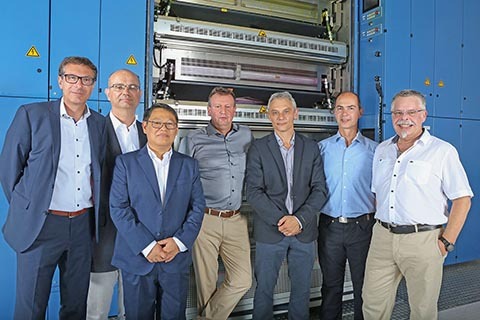 ICP-Roto industrie graphique, a highly respected commercial and newspaper printing house on the island of La Réunion, celebrated its new Cortina from Koenig & Bauer with an official ceremony. Some 300 guests attended the press’ official start-up. “The new Cortina is the centrepiece of our printing house. Our whole team is incredibly proud of the new press. Once again, Koenig & Bauer and our team worked together perfectly on its installation and commissioning,” says managing director and owner Alfred Chane-Pane. The installation of the press line also confirms the importance the company’s management attaches to ecological concerns on an island where the tourism industry dominates. Alfred Chane-Pane: “Environmental protection is a matter dear to our hearts. Given that it eliminates the need for dampening units and all the associated additives, Cortina technology is ideal for the eco-friendly production of many very sophisticated products.” Installed in a new modern press hall, the Cortina has already taken over a large proportion of the company’s overall production. The Cortina comprises an automatic reelstand, an ultra-compact printing tower, an efficient hot-air dryer system, a flexible superstructure and two semi-commercial jaw folders. This impressive press line incorporates numerous automation modules such as the Patras A reel-loading system, automatic plate and circumference change, CleanTronic washing systems and RollerTronic roller locks, as well as colour and cut-off register controls. “The Cortina is definitely much easier to operate than conventional offset presses,” says technical director Philippe Van Damme. The Cortina waterless printing technology permits not only sharper print details and finer screen rulings, but also hybrid production options and seamless switchovers between heatset and coldset production. Full utilisation of these strengths have already been factored in for the future, not least through preparations for expansion with a further coldset web. Through the elimination of dampening units and ink keys, Cortina technology is predestined for applications with variable web widths. This production flexibility facilitates the printing of a broad diversity of job types, such as magazines, brochures and supplements in a standard magazine format, as well as flyers in attractive special formats, alongside traditional tabloid-format newspapers and newspaper-like products. Thanks to the two folders, high-capacity 4-up production is an interesting possibility, and even 8-up production is possible with special formats.